Chronic inflammation may be the underlying cause of many of our most feared illnesses.What do heart patients have in common with people suffering from rheumatoid arthritis, diabetes, gastritis, Alzheimer's, asthma, cancer or obesity? All these are inflammatory diseases. Coronary artery disease is often referred to as inflammation of the blood vessels. And that is why aspirin (an NSAID-non steroidal anti-inflammatory drug) is prescribed to reduce the inflammation. Chronic inflammation fascinates scientists because it indicates that from an evolutionary perspective, our bodies might have become victims of their own success. We evolved as a species because of our ability to fight off various disease-causing bacteria, viruses and pathogens. Inflammation is a biological response to infections. Such survival strategies were important to ward off food- and water-borne diseases. But those same inflammatory strategies are likely to slip beyond our control. It even appears that many of the attributes of a Western lifestyle-such as a diet high in sugars and saturated fats, accompanied by little or no exercise-make it easier for the body to become inflamed. Inflammation destabilises cholesterol deposits in the coronary arteries, leading to heart attacks and, potentially, even strokes. It chews up nerve cells in the brains of Alzheimer's victims. It may even foster the proliferation of abnormal cells and facilitate their transformation into cancer. In other words, chronic inflammation may be the engine that drives many of our most feared illnesses. Problems begin when, for one reason or another, the inflammatory process persists and becomes chronic. The final effects are varied and depend a lot on where in the body the reaction takes place. Heart doctors were among the first to recognise the broader implications of inflammation. They noticed that this defence mechanism plays a key role in cardiovascular disease. For example, it is well known that people with high cholesterol are at a higher risk of a heart attack. However, half of all heart attacks occur in people with normal cholesterol levels. And interestingly, most of them have a high level of inflammation in their bodies. In the case of diabetes, it has been discovered that the disease is a complex interplay between inflammation, insulin and fat-either in the diet or in large folds under the skin. Where inflammation fits into this scenario-as either a cause or an effect-remains unclear. But the case for a central role is getting stronger. Dr Steve Shoelson, an investigator at the Joslin Diabetes Centre in Boston, bred a strain of mice whose fat cells were supercharged inflammation factories. The mice became less efficient at using insulin and went on to develop diabetes. In other words, Shoelson reproduced the whole syndrome of diabetes just by inciting inflammation in the mice. In the case of cancer, back in the 1860s, renowned pathologist Rudolf Virchow speculated that cancerous tumours arise at the site of chronic inflammation. A century later, oncologists paid more attention to the role that various genetic mutations play in promoting abnormal growths that eventually become malignant. Now, researchers are exploring the possibility that mutation and inflammation are mutually reinforcing processes. Left unchecked, they can transform normal cells into potentially deadly tumours. 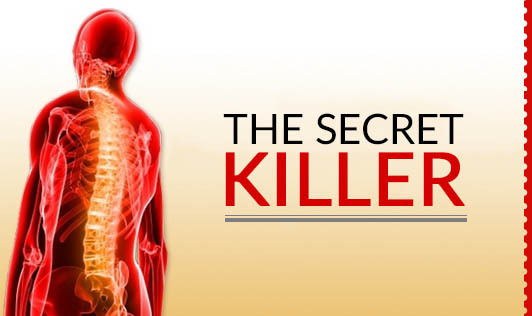 An overweight person is almost always likely to have high inflammation levels in the body. Blood tests prove it. Weight has a way of sneaking onto the middle-aged frame. For example, a teaspoon of sugar has 25 calories. If you consume an extra teaspoon a day without burning off the calories, a year later, you've gained almost a kilo. Ten years later, you've gained 7-8 kilos. Blood tests can determine the level of inflammation in the body. The tests help to identify the secretion of a chemical called interleukin-6 (in overweight people) and an out-of-range C-Reactive Protein (CRP) in seemingly healthy people. A CRP reading of 3.0 mg/L or higher can triple your risk of heart disease-even if you do not have high cholesterol. In contrast, people with extremely low levels of CRP, less than 0.5 mg/L, rarely have heart attacks. While NSAIDS are great at controlling inflammation, they aren't without side effects. Erosion of the stomach lining, weakening of bones, joint and cartilage breakdown and stomach ulcers are some of the side effects of long-term use. The wise thing to do is to control inflammation via food (groan, you didn't want to hear this, right?). Inflammatory foods (see: Food Cure) cause inflammation and anti-inflammatory foods lower inflammation. Keeping your weight in control, eating anti-inflammatory foods and exercise, all help in reducing inflammation. And for those who're still not sure, there are the periodic blood tests to keep a check. Scientists are working on a "one-size-fits-all" drug to cure inflammation. Until it comes into being, you can hit the gym and the salad bar.